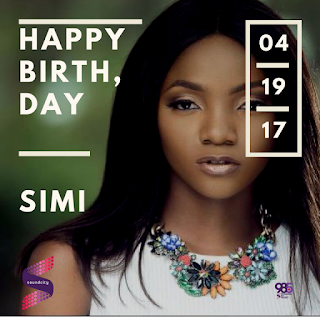 Celebrity news Happy Birthday 5 things you probably don't know about simi as she celebrate her birthday today. 5 things you probably don't know about simi as she celebrate her birthday today. Simisola Bolatito Adeola Opeyemi Oreoluwa Ogunleye popularly known as Simi was born 19th April 1988. The Nigeria singer and songwriter has been in the music industry for quite some time now and she's one artiste that has won the heart of many with her angelic voice. Today as she celebrate, we at Jmedia Nigeria has decided to make this day memorable by listing some things you probably don't know about the Afro pop singer. 1. Simi wrote her first tune at the age of 10 and started singing at the age of 16. 2. Simi is the only girl in the midst of four boys and the last born of four children. 3. Simi was brought up by a single mum because her parent got separated when she was only 9. 4. Simi used to be a tomboy while she was growing up as a result of being the only girl in the midst of four boys. 5. Simi has been in the music industry for about 7 years and still counting. Simi, You have the voice of an angel and the looks of a Greek goddess! May your birthday be something you will be influenced to write a song that's going to win a Grammy-award. Best Wishes to you on your birthday.